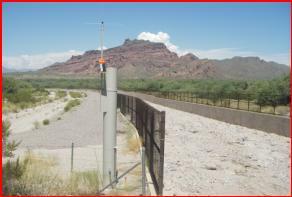 This publication presents the surface water data collected by the Flood Control District of Maricopa County's automated water-level gage network. This telemetered network is located primarily throughout Maricopa County, Arizona with additional gages in Yavapai, Pinal, and La Paz Counties. The surface water data contained in this report were collected, compiled and edited by the Flood Warning Branch of the Engineering Division. Data include mean daily, total, maximum, and minimum discharges at the flow sites; mean daily, maximum, and minimum pool levels at the storage locations; and mean daily, maximum, and minimum volumes stored at the storage locations. Also included are maximum discharges, pool levels, and storage volumes for flood events of interest at each site. This particular report represents a break from the traditional printed format. The edition you are looking at no longer includes hydrographs and flood flow frequency tables. Because much of this information is on-line, an interatctive HTML version of this report is also available. It allows the user to view a wealth of information with the click of a mouse. If you are viewing this docutment on line, select this link to go to the HTML version. As previously, flow frequency tables are included at sites where information is available either from statistical analysis of gage records or from rainfall/runoff models. These estimates of flood flow frequency do not necessarily correspond to regulatory discharges for the channel reaches near the gage sites. Always refer to official regulatory documents for such flood frequency information. The information contained herein is as accurate and complete as possible within the limitations of real-time data collection technology currently available. Wherever possible, notes have been included to identify questionable data. Reliance upon the accuracy, reliability, and authority of this information is solely the responsibility of the user. Revisions to any of these data for any reason will be published in the following years’ reports immediately following the data for the current year for the site where the revisions have been made. The Flood Control District of Maricopa County in cooperation with federal, state, and local agencies collects a large amount of data pertaining to surface water runoff in and around Maricopa County. These data provide a valuable resource for information not otherwise furnished by the traditional sources of this type of material. To make these data readily available to interested parties outside the Flood Control District, the data are published annually in this report entitled "Annual Hydrologic Data Report, Volume II -- Surface Water Data." On-line users of this document have additional resources available by selecting hyperlinks. This report includes records on discharge at stream gages and at flood control storage structures, on depths at flood control storage structures, and on contents at flood control storage structures. Specifically it contains: (1) Streamflow records at 89 stream gages and 40 flood control storage structures; (2) Pool levels of stored water at 43 flood control storage structures; and (3) Storage volumes at 43 flood control storage structures where stage-storage relationships are available. Records included are only averages of data collected at each site during this water year. This is the twelfth annual surface water report published by the District. Prior to water year 1994, surface water data collected by the FCDMC ALERT System were not quality controlled, and therefore, not published. However, there are data resident in archives prior to water year 1994 that may have value to specific individuals. Data are available back to October 1987 for some streamflow sites. The data are collected as a depth of flow in feet (or stage). The discharge and/or contents is then obtained by applying the stage to a rating curve of stage versus discharge in cubic feet per second (cfs), or stage versus contents in acre-feet (ac-ft). The discharge rating curves have been developed at stream gages by using field surveyed cross sections in a HEC-2 or HECRAS step backwater computer model to obtain a range of stage versus discharge points to be plotted on a curve. These step backwater ratings are refined whenever possible using direct and/or indirect measurements made at or near the gage site. For flood control storage structures, discharge ratings were obtained in one of two ways. First, the design ratings may be used. In most cases however, the discharge rating curves were developed by application of the Federal Highway Administration’s HY-8 computer model for culvert flow and U.S. Geological Survey methods for weir flow over the uncontrolled emergency spillways. The storage rating curves were obtained from published as-built or construction plans or developed from digital elevation data. Daily mean discharges are computed by applying the daily mean stages (gage heights) to the stage-discharge curves or tables. The same is similarly true for storage facility contents. The minimum and maximum values are based on instantaneous readings and the volumes for discharge stations are based on accumulations of daily means. Those gages in section 2, Pool Levels at Storage Facilities, which show a continuous gage height during obvious periods of no storage, do so because the orifice to the pressure transducer is set at that gage height above or below 0.0 feet gage datum. All data in this report have been reviewed and edited in an attempt to provide the most accurate data possible. A blank or blanks within the data set is an indication that data was lost either due to hardware, software, or radio problems, or that the gage had not yet been installed. Where possible, these data are flagged with footnotes describing the time the gage was down. In the event that published records require revision, revisions are printed in later reports. Listed in the heading for each gage where records have been revised are all the reports in which revisions have been published for the station and the water years to which the revisions apply (e.g. WY1999: WY1994-95 means that the data for Water Years 1994-1995 were revised in the report for Water Year 1999). ALERT water-level sensors are located on two Corps of Engineers structures. Tat Momolikot and Whitlow Ranch Dams are monitored by the Corps of Engineers. Again, these data are collected in real-time by the FCDMC for the purpose of flood monitoring. The District will publish data for Tat Momolikot since data are no longer collected by the Corps. 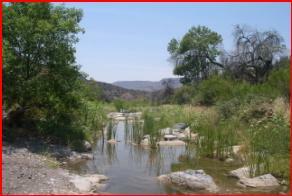 Please refer to the Los Angeles District office for official data for Whitlow Ranch Dam at http://www.spl.usace.army.mil/resreg/. Comments about this report or errors discovered may be forwarded to the Flood Warning Branch using the comment/errata sheet found at the back of this document. Alternately, comments or errors may be sent via Internet e-mail from the FCDMC ALERT System Home Page or directly to deg@mail.maricopa.gov. An index of gage names, numbers, locations, and other descriptors is included following the Definition of Terms in this report. Additional, more detailed, or historical surface water data are available on the FCD ALERT Internet site at http://www.fcd.maricopa.gov/Services/ALERT/default.asp. 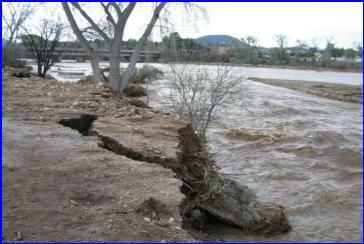 For information about the Internet site, contact the Flood Control District, Engineering Division, Flood Warning and Data Collection Branch at (602) 506-1501. Cave Cr. below Cottonwood Cr. 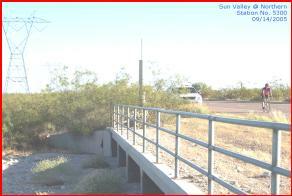 *Gage is a cooperative between ADOT and USGS. There are three additional continuous cooperative gages which the USGS operates, but are not ALERT equipped. In addition to the continuous cooperative stations, the FCDMC also cooperates with the USGS in the collection of peak discharges at a number of crest stage gage sites. The data for these crest stage gage sites are also published by the USGS in its Surface Water Data Reports each water year. Terms related to streamflow and other hydrologic data, as used in this report are defined below. Acre-foot (ac-ft) is the quantity of water required to cover 1 acre to a depth of 1 foot and is equivalent to 43,560 cubic feet or about 326,000 gallons or 1,233 cubic meters. Contents is the volume of water in a reservoir or lake. Unless otherwise indicated, volume is computed on the basis of a level pool. Control designates a feature downstream from the gage that determines the stage-discharge relation at the gage. This feature may be a natural constriction of the channel, an artificial structure, or a uniform cross section over a long reach of the channel. Control structure as used in this report is a structure on a stream or canal that is used to regulate the flow or stage of the stream. Cubic foot per second (cfs) is the rate of discharge representing a volume of 1 cubic foot passing a given point during 1 second and is equivalent to approximately 7.48 gallons per second or 448.8 gallons per minute or 0.02832 cubic meters per second. Cubic foot per second-day is the volume of water represented by a flow of 1 cubic foot per second for 24 hours. It is equivalent to 86,400 cubic feet, approximately 1.9835 acre-feet, or about 646,000 gallons or 2,445 cubic meters. Daily mean discharge is the average discharge in cfs for a 24 hour period from midnight to midnight the following day. Discharge is the volume of water (or more broadly, total fluid plus suspended sediment), that passes a given point within a given period of time. Drainage area of a stream at a specified location is that area, measured in a horizontal plane, enclosed by a topographic divide from which direct surface runoff from precipitation normally drains by gravity into the stream above the specified point. Drainage basin is a part of the surface of the Earth that is occupied by a drainage system, which consists of a surface stream or body of impounded surface water, together with all tributary surface streams and bodies of impounded surface water. El Niño is a condition where sea surface temperatures are warmer in the eastern Pacific Ocean and cooler in the western Pacific Ocean in the lower latitudes. Normal conditions of sea surface temperatures are opposite with warmer waters in the western Pacific and cooler waters in the eastern Pacific. El Niño conditions may result in higher than normal precipitation in the southwestern United States. Flood Elevation Frequency refers to the magnitude (in terms of depth or elevation) and probability of floods at a given flood control impoundment structure. The flood elevation frequency is usually given as a depth or elevation of impoundment associated with a given recurrence interval at a particular flood control impoundment structure. Flood Flow Frequency refers to the magnitude (in terms of peak discharge) and probability of floods at a given gaging station. The flood flow frequency is usually given as a peak discharge associated with a given recurrence interval at a particular gaging station. Gage datum is the elevation of the zero point of the reference gage from which gage height is determined. This elevation is established by a system of levels from known bench marks or by approximation from topographic maps or arbitrarily established to a known point such as a culvert invert elevation. Gage height is the water-surface elevation referred to some arbitrary gage datum. Gage height is often used interchangeably with the more general term "stage," although gage height is more appropriate when used with a reading on a gage. Gaging station is a particular site on a river, stream, canal, lake, or reservoir where systematic observations of hydrologic data are obtained. Instantaneous discharge is the discharge at a particular instant of time. La Niña is when above normal sea surface temperatures exist in the western Pacific Ocean and cooler than normal sea surface temperatures exist in the eastern Pacific Ocean. La Niña conditions usually result in drier than normal conditions in the southwestern United States. Maximum Level is the highest pool level recorded or observed at a particular gaging station at a flood control impoundment structure for a given event. Maximum Storage is the greatest volume of water stored behind or within a flood control impoundment structure for a given event. This occurs at the maximum pool level and is obtained from the stage-storage relation for that maximum level for a particular flood control impoundment structure. Mean discharge (MEAN) is the arithmetic mean of individual daily mean discharges during a specific period. National Geodetic Vertical Datum of 1929 (NGVD 1929) is a geodetic datum derived from a general adjustment of the first order level nets of both the United States and Canada. It was formerly called "Sea Level Datum of 1929" or "mean sea level." Although the datum was derived from the average sea level over a period of many years at 26 tide stations along the Atlantic, Gulf of Mexico, and Pacific Coasts, it does not necessarily represent local mean sea level at any particular place. North American Vertical Datum of 1988 (NAVD 1988) is a datum based on the mass or density of the Earth instead of the varying values of the heights of the seas. Measurements of the acceleration of gravity are made at observation points in a network. Only one point is defined as the datum point. The vertical reference surface is then defined by the surface on which the gravity values are equal to the datum point value. This is called an equipotential surface. Peak Discharge is the maximum instantaneous discharge for a given flood event. Period of Record is the time period for which data exists for a given stream gaging station. Pressure transducer is an instrument used to measure the depth of water. It is an analog instrument which measures a pressure change over a diaphragm. The depth of water is related to the change in pressure over the diaphragm created by the weight of the water over the instrument. Recurrence interval is the reciprocal of the probability of a flood occurring in any given year. Thus, the flood having a 1% (1/100, or 1 in 100) chance of occurring in any given year has a recurrence interval of 100 years and is referred to as the 100-year flood. Similarly, the flood having a 50% (1/2 or 1 in 2) chance of occurring in any given year has a recurrence interval of 2 years and is referred to as the 2-year flood. Staff gage is a device located at the gaging station to provide a visual reference to the depth of water at a gage in terms of gage height above the water level measuring instrument. Stage-discharge relation is the relation between gage height (stage) and the volume of water, per unit of time, flowing in a channel. Stage-storage relation is the relation between gage height (stage) and the volume of water stored behind or within a flood control impoundment structure. Streamflow is the discharge that occurs in a natural channel. Although the term "discharge" can be applied to the flow of a canal, the word "streamflow" uniquely describes the discharge in a surface stream course. The term "streamflow" is more general than "runoff" as streamflow may be applied to discharge whether or not it is affected by diversion or regulation. Water year dealing with surface-water data is the 12-month period, October 1 through September 30. The water year is designated by the calendar year in which it ends and includes 9 of the 12 months. Thus, the water year beginning October 1, 2005 and ending September 30, 2006, is called the "2006 Water Year." 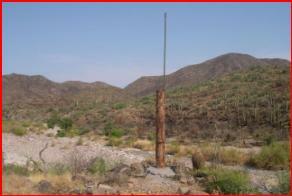 Four new streamgages were installed during Water Year 2005. The table below provides details about the streamgages. Selecting the hyperlink of the gage name will take the user to the Internet page for the gage. Selecting the hyperlink of the page will take the user to the data page within this document. Salt R. @ Priest Dr.
IBW @ Indian Bend Rd. Cave Cr. nr Cave Cr. Agua Fria @ Grand Ave. Skunk Cr. nr New R.
New River @ Bell Rd. EMF @ Queen Creek Rd.